In summer we travel from shade to shade. Early mornings, cup of coffee in hand, are spent on the terrace, sitting on a rock at the entrance to one of our caves and contemplating. The shade of the huge cliff at your back is a welcome relief after a hot night’s suffering. 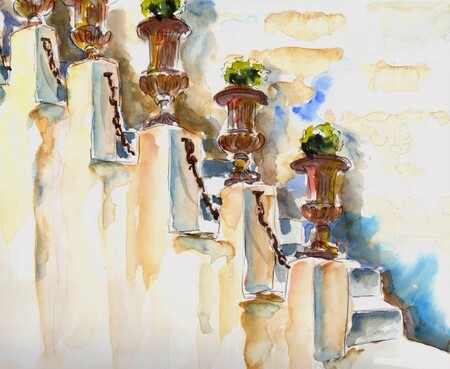 These stairs, leading up to the terrace, were done in pen and watercolor, on Fabriano WC paperHP(extra white). 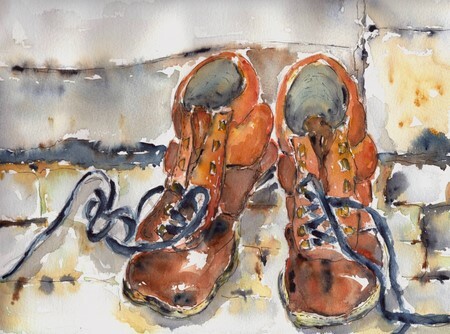 After all that meditating and musing, while watching the sun brightening the skies, it is time to move out of the shade and into the working shoes, which are ready on the go at the kitchen door. These are actually the working boots of Hartman, mine wasn’t to be found, but they aren’t as characterful as his anyway. But, pretending they are mine, they will prune and dig and weed and water, while the sun still has a gentle caress. This was done in pen and watercolor on Fabriano CP paper. Finally the day will end in the welcoming shade of our summer kitchen right at the back of the garden, where we enjoy the most wonderful alfresco meals, prepared by Hartman. (The door right at the back goes into a cave, which accounts for the wonderful coolness in summer)This is his kingdom, where he cooks and fries and experiments and flips and flops, with me in the role of sous-chef and lighting candles and lanterns, picking herbs, fiddling here and meddling there. We play guitar and sing and eat and while away the beautiful summer evenings, ending it all with some more contemplating and musing. Tomorrow we’ll start the day again, moving from shade tot shade. This was done in watercolor on Fabriano HP. Wow- what a great entry! 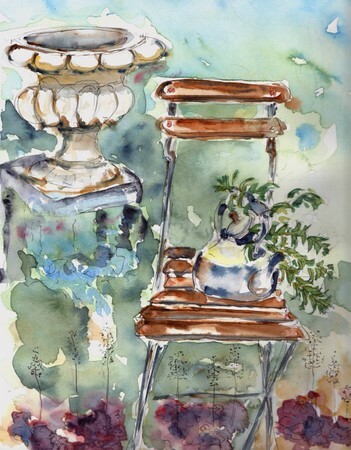 Thanks for sharing this illustrated peek into a summer day for you and Hartman… gorgeous stuff! 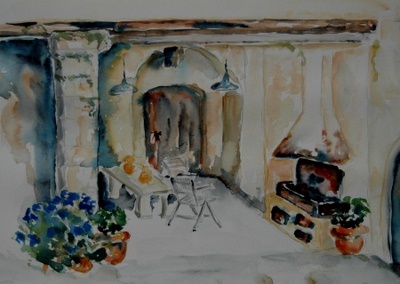 So lovely Ronell and restful and light – makes me yearn to get out into my garden. Lovely to hear about your summer days and to see your illustrations of it! I enjoyed v e r y much reading your blog entry and seeing the wonderful, loose sketches!!! Keep up the good work!!! Ronell, you have been busy doing these lovely paintings! They are all fabulous! My favourite one is of the teapot and the mint growing in it. The ‘cave’ is fascinating because of the perspective and the story behind it. oh, I am envious of you as well! These are all so lovely and inviting! I am already in a mental travel mode and anticipating my trip this fall. I am so excited about meeting you, Casey and Robyn! My day was spent having my nails done, a pedicure and out for sushi with my husband and then an art show this evening. Maybe tomorrow I should play in the garden! Yours is the first shade challenge response I’ve seen. I can’t think of what to do so was pleased to see your response. WOWOW!!! What a way to live a life .. what spectacular sketching and painting!! I am awed! If there were “best blog entry” awards–you would get it!! What a fascinating narative of a day in the life of. . . The drawings and loose watercolor technique is absolutely FANTASTIC! My favorite is your summer kitchen/cave entrance–OHMYGOSH I would absolutely LOVE to cook in that kitchen!!! What a wonderful life and so happy you share it with us-THANKS!! I love your “day in the life of”. Lovely sketches. The stairs are so lyrical!! Thanks for sharing a slice of your day. sketches are lovely and the post well written. i especially like the first one because you’ve tackled perspective which is one of my stumbling blocks. What a beautiful, poetic rendering of you private world, there behind the big old wooden gate. Those cars buzzing past have no idea what a paradise you’re hiding! Lovely story, beautiful paintings and the perfect way to spend a summer day! Thanks for sharing! What an idyllic way to spend the day – thanks for sharing! Beautiful paintings, as always. I don’t know how you manage to keep them so loose and casual looking, and yet have such accuracy in things like the chair, steps and perspective. You talented lady! What a wonderful story teller… I could read a whole book with you as the author … bravo!I can’t pick a favorite of your watercolors….. I want them all. Beautiful colors depicting a summer day. lovely as usual…what time is dinner??? :> and whats hartmann cooking?! STUNNING!!! The art and the commentary!! As the paintings downloaded I loved the next one and then the next one. Just stunning!!! Okay – that’s done it! Now I’m in love with Hartman! Absolutely wonderful! What a fabulous life you live. You are an inspiration. Thank you so much for all your kind and encouraging comments and a special thanks to Hartman for his appreciation…for having had me sitting and crying here…because I’m happy. Hie hie Robyn, you make me laugh…you and your husband should hop on the plane and come visit…them men can cook and we can…well..do what we do best? And that goes for you too Sandy, come and cook and eat! wish I had a summer kitchen… is it really in a cave? lovely paintings! ah ronelle…is that invite still open to me next fall? LOL…I’m in love with Hartman now too! Oh Ronell, we’d so love to come but our dogs have shocking table manners! These are beautiful paintings and great commentary.